Harness Technology offers a range of computer support and IT consulting services such as system design, network support, maintenance contracts and much more for small business and medium-sized businesses from Boston to Worcester. We enhance our clients' productivity by applying elegant, yet cost-effective solutions based on 17 years experience providing network support services, system design, IT consulting and software solutions. We focus on the unique needs and budgets of small business (5-100 users) and pride ourselves in finding optimal IT support solutions and technologies. Harness Technology announces a newly-enhanced Managed SystemCare program that combines 24/7 world-class computer network monitoring with remote maintenance and support - in an affordable package. Better yet, the new pricing scheme offers fixed IT support costs that will save you money and minimize network interruptions and downtime! We've assembled a set of powerful tools to monitor your servers, desktops, printers, and firewall. We know what a perfect network looks like - it's invisible! 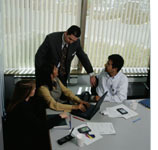 Network and System Consulting - Special Projects. Call 508.877.0707 to schedule a free consultation. Switching IT providers is easier than you think. It's not uncommon for companies to stay with an IT support company even if they are not getting the service they deserve. That's because there is a perception that it is difficult to change computer service vendors. Not so. Harness Technology is a time tested competent IT service provider. Our top 10 clients have been with us for an average of 12.3 years!